LOOK NO FURTHER! The Kona Retreat is luxury and location on your budget. This spacious two story private island style home is located between Kailua Village and Keauhou in a peaceful upscale neighborhood at 300’elevation, just minutes from all the activities that the Gold Coast is famous for. The main living areas are on the upper level of the home and include an immense kitchen and living room which open to a large covered lanai - all of which have dramatic vaulted ceilings with ocean and/or mountain views. The main sleeping areas include a stunning master suite with jetted tub and separate shower and a second spacious bedroom and a full bath,- both of which have cal-king beds. A heart-shaped custom pool – which is surrounded by an array of tropical vegetation - including mango papaya, oranges, bananas, limes and lemons – and ginger of all colors – all of this providing privacy and serenity. Back inside and downstairs, the lower level has a den – with a queen bed and a futon sofa - for additional sleeping accommodations. Add the lower lanai – where the washer and dryer are located - AND – an outside shower to rinse the sand out of all of those places you didn’t think sand could go – and rinse the beach gear too! This is the base package – 3 sleeping areas / 2 king beds / 1 Queen Bed / 1 Full Futon / 2 baths. But – There is MORE! There are also an additional en suite bedroom which opens to the pool deck that can be added for larger family groups. It has two queen beds, a private bath and kitchenette. Please email us for more info and pricing on these if your group needs more space. This contemporary and green island style home was designed to take advantage of the naturally occurring ocean and mountain breezes that can change like clockwork during the island day. The upper level has large jalousie window openings, 8' lanai doors, a huge copula opening in the roof, and ceiling fans to assist the natural mountain and ocean breezes. The Kona Retreat became carbon neutral in 2011. 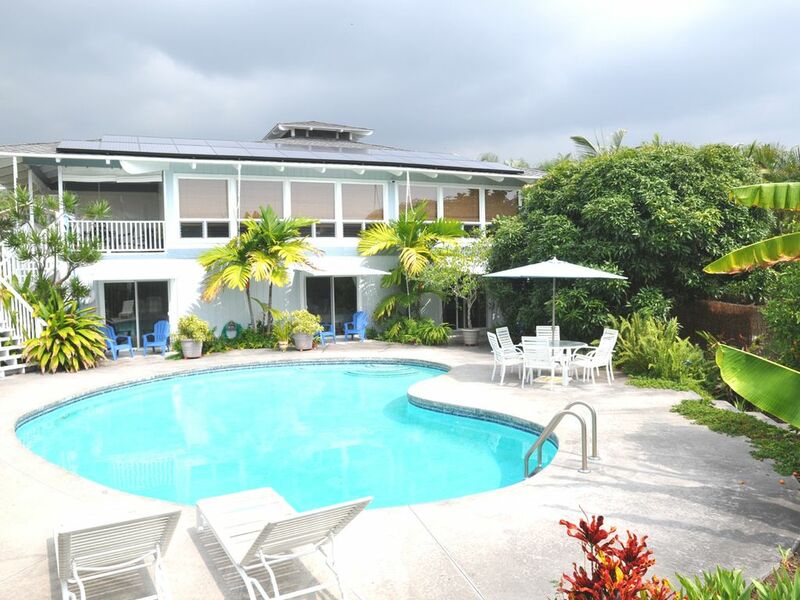 A PV solar array was added that generates the electricity the retreat consumes. In addition, hot water is generated by a passive solar system as well. High-Speed Wireless Internet access is standard. The living room includes a unique oversized bamboo sofa and loveseat - a great place to relax and watch the flat screen TV with satellite Dish and DVD. Hosts are available to help with any of your needs from suggesting restaurants and activities – or to fill the refrigerator prior to your arrival - just ask when you book your stay. We are dedicated to making sure you have the best experience possible. Great care is taken to insure that everything is fresh, clean and inviting, well-maintained and updated. Only quality towels and linens make it to the bathrooms and bedrooms. This flexible rental is designed to accommodate 1-6 (up to 8 on special request) people with our base rental configuration - 2 king beds, and 2 baths, 1 queen bed and 1 full futon. Well behaved children who are quiet in the morning and respectful in the evening are welcome at the retreat. We offer a full size crib, booster seats, stroller and baby gates to complying children. • Rates posted CAN CHANGE AT ANY TIME! Coin-Operated Commercial Washer available on-site. Check machine for current rate. Coin-Operated Commercial Dryer available on-site. Check machine for current rate. 3 separate deck areas PLUS pool surround. Sunken into it's own 'island', hot tub/spa kept at 100F with bridge to the pool deck,.